If you were alive in the 1980s, when Belinda Carlisle gleefully proclaimed that "heaven is a place on Earth" (or if you watched the best hour of modern television on Netflix at any time in the past year) it might not come as a huge surprise to learn that hell, too, is a place on Earth. Specifically, it's located in Dallol, Ethiopia, where the average daily temperature is 94°F, making it the hottest place in the world. How Hot is Dallol, Ethiopia? Dallol, Ethiopia is the hottest place on Earth based on year-round averages, which is to say that if you average the temperature of every place on Earth for one year, Dallol's average (again, 94°F) will be the highest. There are places in the world that are hotter at given moments—Hassi-Messaoud, Algeria is 115°F is the hottest place in the world at the time this article first went live on TripSavvy, according to WxNow.com—but Dallol is the hottest on average. Another thing that makes Dallol so hot, its high humidity (around 60%) and the noxious fumes that rise out of its Hades-looking sulfur pools notwithstanding, is the fact that it doesn't cool off at night. While many of the world's hot spots are located in deserts, where temperature extremes between day and night are just as dramatic as the extreme temperatures experienced during either, Dallol has an average low temperature of 87°F, which is hotter than many places on Earth ever get. Do People Live in Dallol, Ethiopia? Dallol is officially considered a ghost town – in other words, no people live there full-time. In the past, several commercial operations have been carried out in and around Dallol. These have mainly centered around mining, from potash to salt, although these stopped in the 1960s, thanks to Dallol's remote location. Is It Possible to Visit Dallol, Ethiopia? Yes, of course, though as suggested in the previous section, doing this independently is tedious, to say the least. Indeed, if you happened to be in northern Ethiopia, you could hire a camel and a guide to take you to Dallol. There are a couple of problems with this in reality, however. 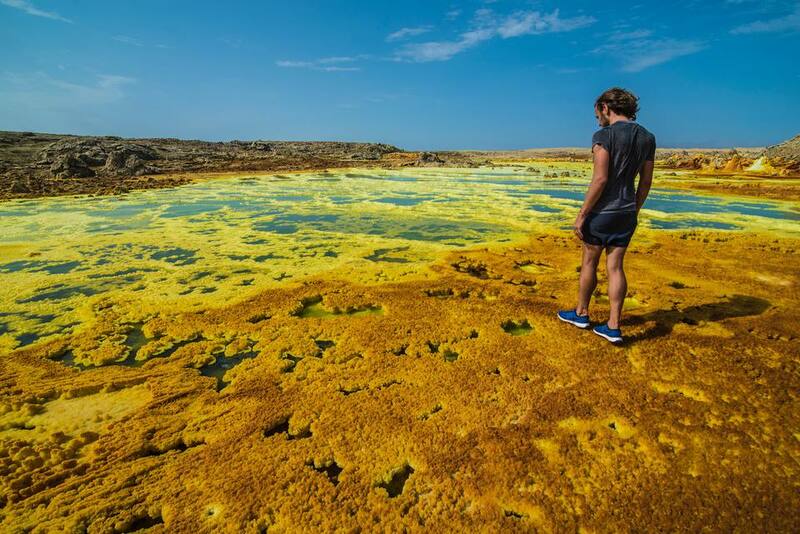 First and foremost, since infrastructure is generally poor in Ethiopia, getting to a place where you could hire a guide who would take you to Dallol – and finding said "place" in the middle of the nothingness that characterizes much of Ethiopia – would be difficult or even impossible, to say nothing of the questionable safety of doing such a thing. Secondly, any camel that goes in and out of Dallol these days is hauling one thing, and it's not tourists. Camels are still incredibly important to the salt mining industry in Afar, the region where you find Dallol, although it reminds to be seen how long this will be the case. The smarter option would be to take a tour, which isn't terribly out of left field for travelers to Ethiopia—most travelers who visit the country don't travel completely independently but rather, on some combination of organized tours to see main attractions, due to Ethiopia's questionable infrastructure. Many tour companies offer excursions to Dallol, such as Wonders of Ethiopia. The good thing about these tours is that you can visit other highlight of the Danakil Depression region, where Dallol is located. Most notably, you can hike up to the crater of Erta Ale, a volcano that's home to one of the world's only persistent lava lakes. It's important to note that regardless of how you access Dallol, you should stay with your guide at all times; and absent that, use common sense. It's not very difficult to die in a climate like this! Also, those pools of blue and green liquid you see aren't water, but sulfuric acid that's concentrated enough to dissolve the sole of your shoe. Don't you dare consider touching it, or even stepping in it!